Waheguru Ji Ka Khalsa Waheguru Ji Ki Fateh. Hukamnama today is in Raag Soohee by Guru Ram Daas Ji on Ang 733 of Sri Guru Granth Sahib Ji. Wherever you aaraaDhee-ai you remember Waheguru, you remember Hari,tithai in that situation, in that place Hari, Waheguru becomes mit sahaa-ee, becomes our friend, becomes our support. O my brothers, O my bhaa-ee, sanchee-ai gather together, har Dhan, the wealth of Hari, the wealth of God's name. If you do this, if you gather together the wealth of the Waheguru Ji's naam thenhalat, this world, palat, and in the next world, har ho-ay sakhaa-ee, Waheguru, Hari, Akaal Purakh will be sakhaa-ee, will support you in this world and the next. rahaa-o, Guru Ji says pause and think about this. Where can you get this wealth, we may ask the Guru. Guru Ram Daas Ji says jsatsangtee sanghar Dhan khatee-ai, we can khatee-ai obtain the Hari Dhan, the wealth of Waheguru Ji's naam, the wealth of Hari, of Waheguru. hor thai In any other method horat upaa-ay, upaa-ay means any type of means, any type of method, har Dhan kitai na paa-ee, you cannot find that Waheguru's naam anywhere else. Guru Sahib Ji says only insaran, protection of Dhan Dhan Sri Guru Granth Sahib Ji and in the footsteps of sadhsangat. Those people who are vapaaree-aa, who are traders inratnai, diamond of Waheguru Ji's naam, har ratan Dhan vihaajhay, they gather naam, the Hari ratan, Waheguru Ji's diamond Naam, Waheguru Ji's wealth of Naam. Those people who arevapaaree-aa, who traders in glass,kachai, in falsehood, you cannot get HariDhan, you cannot get Waheguru Ji's naam from any other people who are false. Guru Piaaree Sadhsangat Ji, Guru Ji is saying to us, all those fakes out there cannot give us what SatGuru Granth Sahib Ji can give us. Realize this what our father Guru Granth Sahib Ji can give us no one else in the world can give us. The name of Waheguru Ji's naam, of Hari, Waheguru Ji's wealth har Dhan, is like ratan javayhar maanak, is like diamonds, gems, rubies. Remembering Japji Sahib, Guru Sahib Ji says mat vich ratan javayhar maanik jay ik gur kee sikh sunee. The words of Waheguru is words of diamonds, like peace of jewels, like virtue of rubies, like harmony. In the amrit vayla, in the ambrosial time, in the mortal time of immortality, where the world sleeps but only those who love God, those who love Guru are awake. har bhagtee har liv laa-ee The consciousness, the liv, the attention of the devotees, of the bhagat can be connected to Waheguru and they can gather together the har Dhan, wealth of Waheguru. That which is been beeji-a, thathar Dhan, that wealth of Waheguru, the seeds of which have been sown in amrit vayla, the bhagat, devotees khaa-ay kharach rahay, they eat that, they spend that, they use that throughout their lives. nikhutai naahee It nevernikhutai, means never finishes, it never ends. It never exhausts and it never tires out . Guru Sahib Ji is saying, O Gursikho, get up in the Amrit vaylaa, gather together the har Dham, the wealth of Waheguru Ji's naam and it will never end. halat, in this world;palat, in the next world, through the har Dham, through the wealth of Waheguru Ji's naam, through the wealth of Waheguru Ji's gi-aan, through the wealth of Waheguru Ji's Gurmat, bhagtaa ka-o milee vadi-aa-ee, the devotees , the ones who are imbued with love for Satguru Granth Sahib Ji's Magaraj, the ones who are imbued with love for Akaal Purakh Ji, they will blessed withvadi-aa-ee, with greatness, with glory. The wealth of Waheguru makes younirbha-o, fearless, sadaa sadaa asthir hai, this wealth of Waheguru Ji's naam is forever and forever permanent. No one can move it. sachaa and is the truth, satnaam, it is the satnaam. ih har Dhan agnee taskarai The wealth of Waheguru Ji's naam is agnee, fire, taskarai, leaves, paanee-ai, water jamdootai, even the angels of death, the messengers of death, jamdootai kisai kaa gavaa-i-aa na jaa-ee no one can take this from you. jeh maat pitaa sut meet na bhaa-ee man oohaa naam terai sang sahaa-ee, jahan mahaa bhay-aan doot jum daleh teh kayval naam sang terai chal-lah In the second Ashta-padee of Sukhmani Sahib Guru Arjan Dev Ji says the same thing. No one can take this Naam away from you. uchkaa means thief; robbers cannot even come near of Waheguru Ji's naam. jam jaagaatee dand na lagaa-ee, jam doot, the angels of death cannot dand na lagaa-ee, touch it. They cannot attack those people who are gathered together this wealth. They cannot come near that person who has this wealth of Naam. saaktee, those people who have no faith, people who are cynics of the Guru, those people have no faith in Waheguru, what have they done? paap kar kai, they have done sins, bikhi-aa Dhan sanchi-aa, they have collected together the Dhan, the wealth of what? They have sanchi-aa - collected together the wealth of bikhi-aa , of poison. tinaa ik vikh naal na jaa-ee But for them not even one of their poisons will help them, not even one. In fact those poisons are the ones which will ensnare them and entrap them in this world. In this world the people who are saakat, who have no faith in the Guru, because of all the paap, all the sins they have collected together they are duhaylay, they have horrible time, they are moserable. Those people who have not got the wealth of Naam, are miserable because only the Naam can release us. hathahu chhurhak ga-i-aa, the time that they had to meditate upon Waheguru has gone from their hands, hathahu means hands and chhurhak ga-i-aa means to slip away. agai palat - in next world, saakat - the faithless ones, har dargehdho-ee na paa-ee, they will not find a place, dho-ee, they will not find a shelter in court of Waheguru. When the Sikhs ask who is the greatest trader, the greatest banker, the greatest merchant of all this wealth? Guru Ram Daas Ji says, O santo, O saints, O Gursikho, har Dhan kaa saahu har aap hai santahu, Hari himself is the saaho, is the banker, is the greatest merchant of this har Dhan, of this spiritual wealth. jis no day-ay so har Dhan lad chalaa-ee, those to whom Waheguru Ji gives this wealth only those people can take away the benefit of this har Dhan, of this wealth of Waheguru. 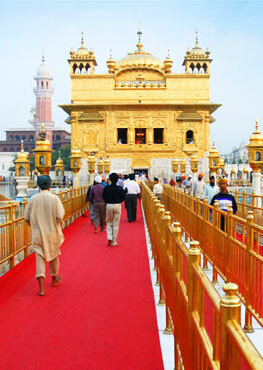 There can never be an end, totaa, an exhaustion of this wealth of Waheguru. jan naanak ka-o gur sojhee paa-ee Servant Nanak has been blessed with this sojhee, with this understanding that there is no end to the wealth of Waheguru, that there is no end to this spiritual wealth. It is only conferred upon those who are blessed with Guru's Grace, who are blessed with Guru's parsaad, with Guru'skirpaa. May Guru Ram Daas Ji do kirpaa on us all, may he bless us with the Nanak Naam, and may the Nanak Naam bring us in Chardikalaa and thentayray bhanay sarbat da bhalaa.